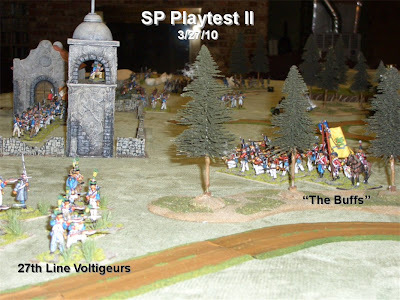 Thanks to Adrian, Scott, James and Lawrence for assisting in the playtesting for a Sharp Practice game being hosted at Enfilade in May. It was a long and grueling day but everyone hung in there and we worked out a lot of bugs. Another playtest will really help fine tune the game; hopefully get in two more playtests before Enfilade. We actually got in two playtest games today - after the first game, we tweaked the game a little and played another round. 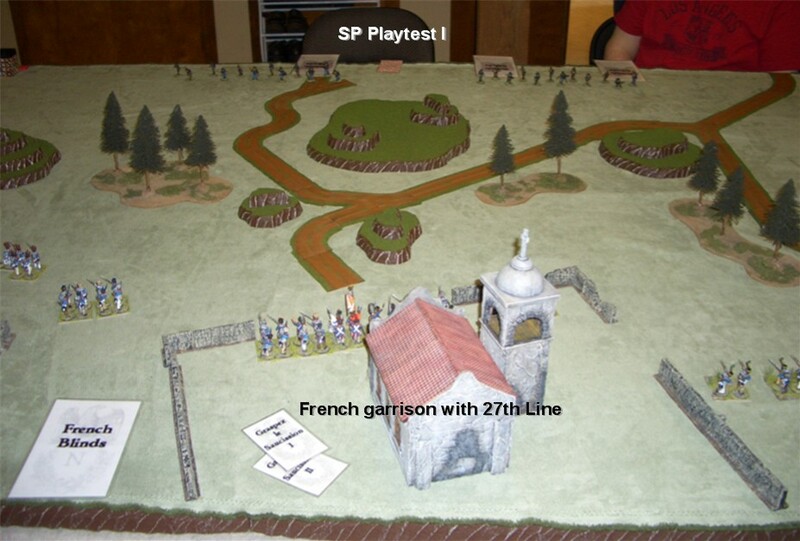 The initial scenario is a French unit in garrison awaiting the arrival of a relief column (using blinds). The British with Portuguese and Spanish allies are moving on the garrison - mostly using blinds. 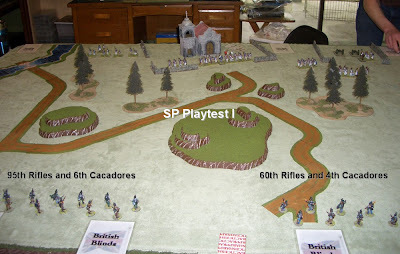 Two British Rifle units with Portuguese Cacadores are the only two British units that come on the table without blinds. 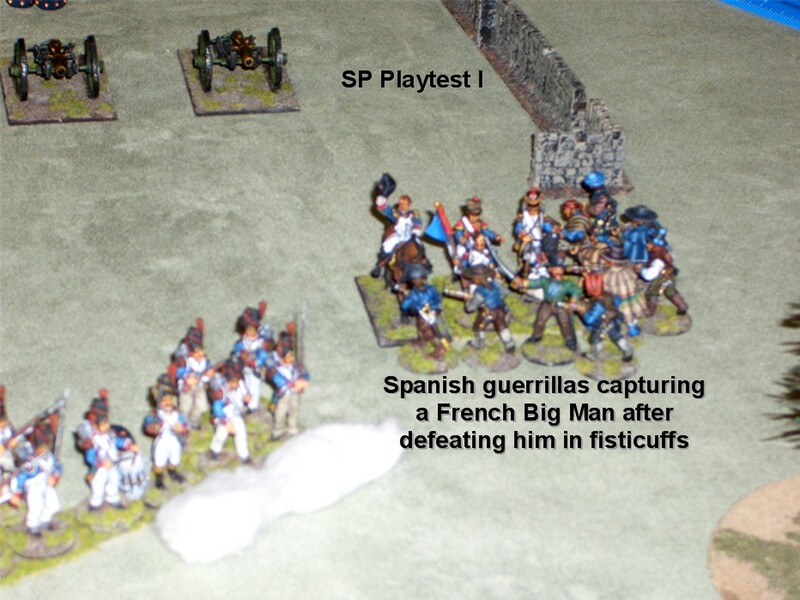 The Spanish Guerrillas come on with the Blank Card - anywhere on the table up to 12" from any French unit. 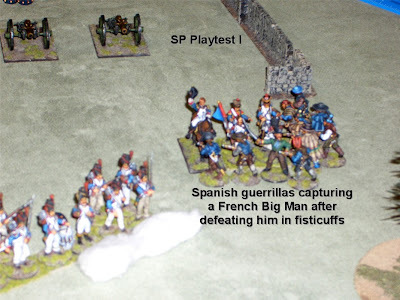 The first playtest ended fairly quickly as Scott placed his Spanish guerrillas at a great spot after drawing the Blank Card- next to an exposed French Big Man. They subsequently charged and attacked the level II French Big Man - defeating him and his entourage of drummers and sycophants (drummers, porte-fanion, and pioneer). He was thus captured and my initial Victory Condition was the capture of a Big Man of level II or higher. I didn't realize how quick and easy it would be. The second game was played with revised Victory Conditions - basically point based, more than certain events occurring that would end the game. 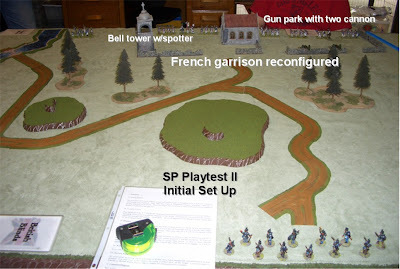 Adrian also reconfigured the French garrison to make it more linear and connected. 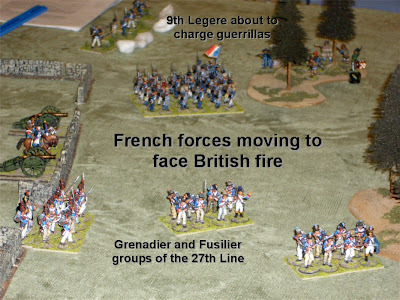 One of the Victory Conditions is for the British to outnumber the French inside walls of the garrison. We also adjusted the use of Sentries - in the first game we used one lone sentry at a point in the cross-roads - we couldn't figure out a good way for him to get word back if an enemy unit was successfully spotted. Especially since he would use up his two action dice to spot. 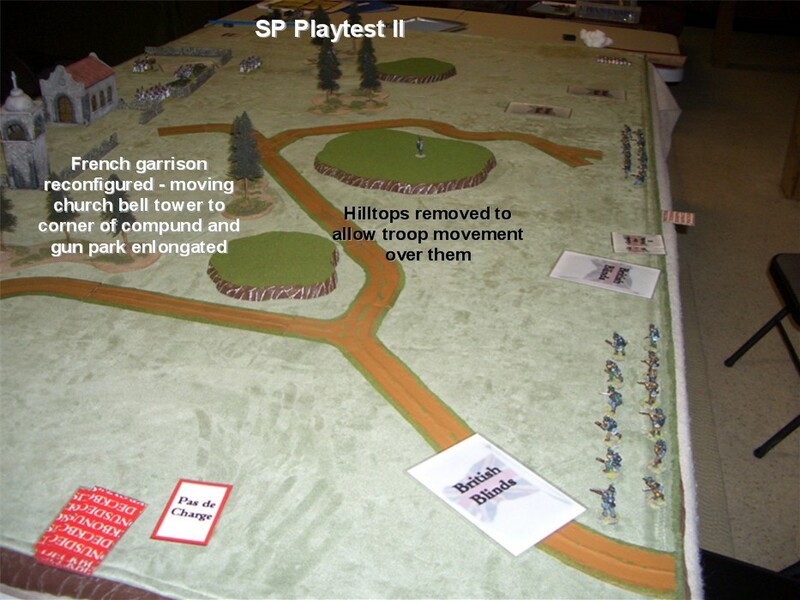 In the second playtest, we first were going to put three sentries on hilltops, but then decided to place just one in the church bell tower. Here he could spot and easily relay the info to the troops below. It seems so common sense now - but prior to the playtesting, I hadn't envisioned any problems placing him at the crossroads. Okay - no more excuses - moving on to Playtest II. 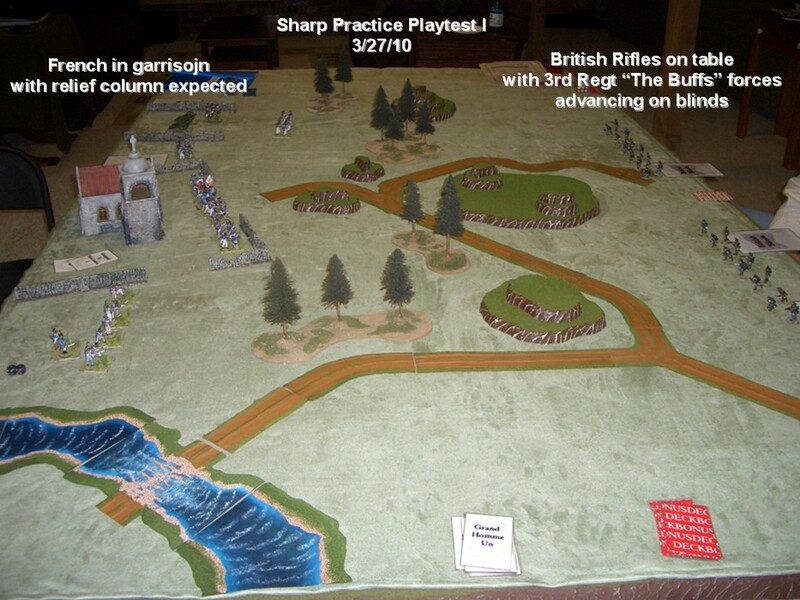 Another tweak for the next playtest will be allowing the British to come on a bit closer. The two games today had all British come on at table edge - this will be changed to 12" for units on Blinds and 24" the two Rifles units not on Blinds- speeding up engagement or spotting - as some legendary gamers would say, "Let's get to the shooting as quickly as possible!" Again, many thanks to Adrian, Scott, James and Lawrence for their invaluable assistance and excellent recommendations. They really made the playtesting about as productive and useful as can be imagined. I owe them big time. The crew are from OG's "Boxer Rising" range, and the guns are from their "Boer War" range - listed as "75mm Creoson Gun" on this OG site and "75mm Creosot Gun" on this OG site I can't seem to find info on the web using either names for the search. I ordered it because of the picture of it in the first site - being used with the Japanese from the Boxer Rising range - I was told by OG (Teresa) that's the gun for the crew. I'm not even sure of the colors - due to my failed web search. I just gave it a light blue-grey finish. Figured that's how some German guns were painted at the time - and the Japanese sort of following their lead after the Franco-Prussian War. Only four crewmen are assigned to each gun per TSATF rules (at least what I was told). I may add a couple more when I use "The Great War" rules. All the figures for the Boxer Rebellion game are completed; I can now concentrate more on my Sharp Practice game - the first playtest is this Saturday (March 27). Hopefully it comes off well and I will post an AAR. UPDATE: Thanks to the comment by JKM and link provided - the cannon is actually called a Creusot, neither of the spellings used on the two OG sites above. Just to show my ignorance again, here's another link which has the short answer of the Burgundian town of Le Creusot which gave its name to the cannon. It apparently has the natural resources to have produced tons of cannon, armor, and now cooking pots. Hey, I'm a uniforms guy, not a weapons guy. My apologies to the fine armorers and artisans of Le Creusot. At least I knew the carriage is upside down in this picture. The first play test for the Boxer Rebellion game using TSATF rules went fairly well today, especially considering the announcement for this game was made only a couple of weeks ago on the NHMGS Yahoo Group . 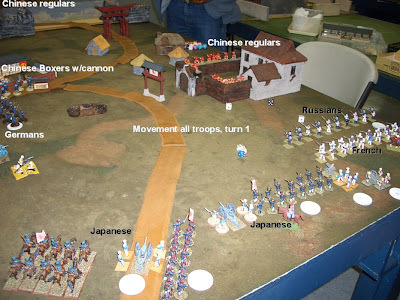 In fact, I wasn't exactly clear on who and what armies would be involved; as it turned out I'm the only one with a Japanese army - so that was good. Chris B. is pretty much in charge of this game, and Herbie is supplying mass-quantities of Chinese and some cool terrain. Bruce (who played in my Sharp Practice game a couple of months ago) showed up with some impressive terrain as well as figures. I must say these guys really are into the Boxer Rebellion - and have done extensive research on it. After spending some time figuring out what kind of scenario to play, the terrain was set up and we broke down units amongst the six players (three Chinese - three damn Legations!). I ran my freshly painted Japanese infantry and cavalry, and two cannon. Bruce loaned me some spare figures as stand-ins to crew the guns. 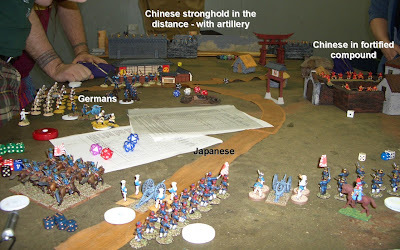 The Japanese were broken down into four units - one 10-man cavalry unit, one 15-man infantry unit, one artillery unit, and one combined 15-man infantry and artillery unit. Oh, and Herbie loaned me a really cool mounted general - a Copplestone Chinese general. I'm going to get one of these guys and paint him up as a Japanese general. Here are some pictures with captions that I hope I didn't mislabel. We ended the game after several turns, and having a pretty good idea how the game should be set up for Enfilade. Herbie has a lot more Chinese troops that weren't used, so maybe having several Chinese strongholds as objectives might be a good scenario. Also, allowing the imperialist troops to come on the table at more points may be a good option. All in all, it was a good game - not only did I get the troops I just painted on the table, but I also got to use them in a rule set I had never tried before. I look forward to another round or two of this. 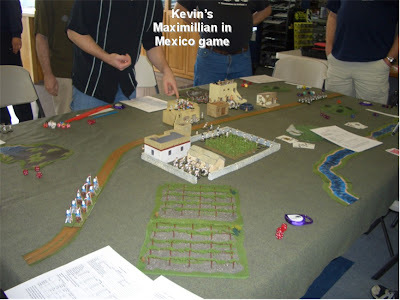 Being NHMGS games day at The Game Matrix today, there were a couple of other historical games going on; Bruce M. running a FoG game with Chinese, and Kevin S. running his Maximillian in Mexico game. Unfortunately, I was so engrossed in the Boxer game I only managed to take a photo of Kevin's game - Bruce had already finished his game. 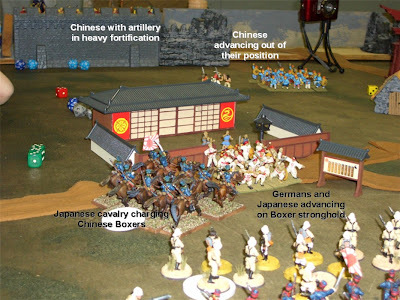 Here are some pictures of the recently painted and based Japanese cavalry unit for the Boxer Rebellion game. Just in time too, as tomorrow is the first playtest. I still have to finish the cannon and crew, but I might bring the unpainted cannon to the playtest, and use some infantry troops as stand ins for the crew. They are nicely sculpted with the frogging on the "Attila" tunics well-defined. The red trousers betray a strong French influence, in spite of their attention turning towards Germany after the Franco-Prussian War. The flag is from Warflag.com. As with the two infantry standards, the staff still needs a gold chrysanthemum finial - or maybe it got shot off in combat. 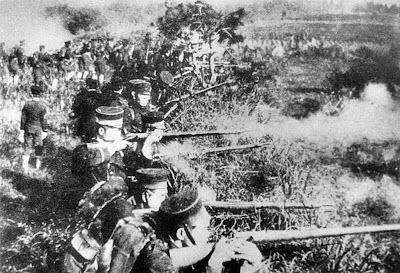 The pictures below show the Japanese army during the Sino-Japanese War of 1894-1895. 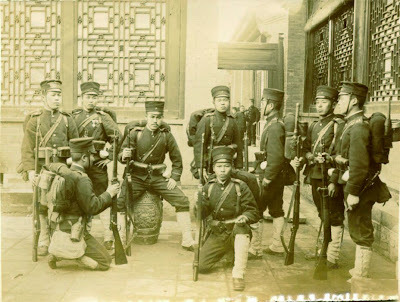 The next two are from the Boxer Rebellion, 1900. 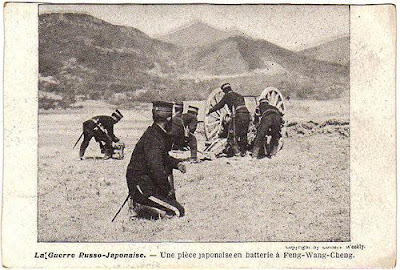 This last photo shows Japanese artillery during the Russo-Japanese War of 1904-1905. The uniform still closely resembles the type worn in the two earlier wars. 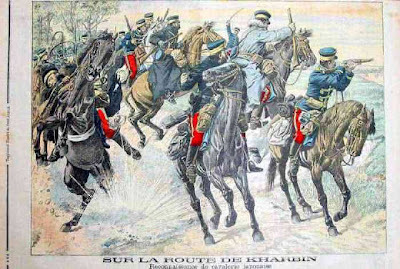 In fact, even after the khaki uniform was introduced, many troops, particularly the artillery, were still wearing the older blue uniform until the end of the war. I was looking for color and assembly guide for the OG Creosot 75mm gun, but found this RJW b&w film clip on You Tube. All the foot figures for the two upcoming Enfilade games are completed - the Victrix Cacadores for Sharp Practice and OG Japanese Infantry for TSATF Boxer Rebellion. 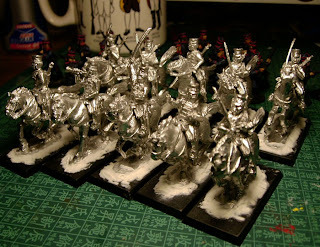 The Victrix Cacadores are the new metals sculpted by Paul Hicks. These are beautifully sculpted with amazing detail - like the hunting horn emblems on the ammo pouches and shakos. The shakos clearly bear the numeral 6, for the 6th Battalion. The packs of Cacadore with rifles and muskets were mixed together and some painted as the 6th with yellow facings and others with light blue facings for the 4th Battalion. The ones with rifles have powder horns, a small pouch on the belt, sword bayonet, and unbloused trousers.The ones with muskets have bayonets, backpacks with rolled greatcoats, and gaiters. The are a perfect match with the metal Perry Riflemen - in both style and size. I had actually expected this from the earlier Victrix metals Mr. Hicks sculpted. In fact, the Cacadores will be intergrated with the British Rifles for the Sharp Practice game - the guys with muskets will pretend to have rifles for that game. 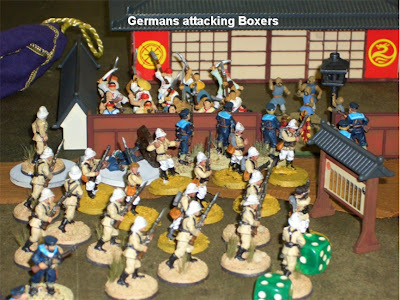 The OG Japanese Infantry from the Boxer Rising range are also completed. 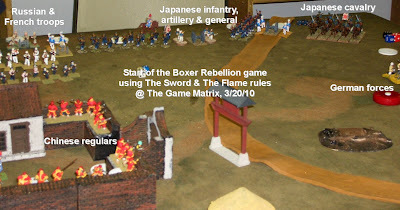 These will be used in a Boxer Rebellion game using The Sword and The Flame rules. In fact, the first playtest is next Saturday. If I'm not burnt out from that game, I'll hold my first Sharp Practice playtest afterwards - or maybe the following Saturday. These guys are painted as regular line infantry with yellow facings. The flag is from the superb Warflag.com site. These are Imperial Guard infantry with red facings. I think the line guys look nicer with yellow facings. The whole gang with the poor line troops leading the charge. I used a new (for me) flocking technique; primarily to save time. Brown paint was slopped on the base and then dipped into a mixture of sand, green flock, and dried coffee grounds. It seems to work okay, and save a couple of steps I normally use. Leaving work this evening I was debating to work on the OG Japanese Infantry as I was feeling a bit tired; However, when I got home and looked on the kitchen table a package was there - my family always leaves my packages unopened, so I knew it was the Victrix order. I just placed the order on February 26 from Maelstrom Games in the UK. Free shipping and their prices can't be beat. I found out about them on TMP and figured I'd give them a try - they are definitely on my A-list for suppliers now. I really wanted to order via my FLGS, but even the owner there told me he was having trouble with his Victrix suppliers. They are nicely packaged in the standard plastic blisters most companies use for packs of about 8 figures. 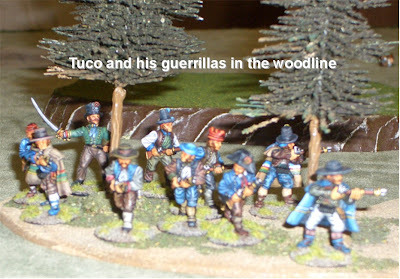 In the photo below, the Cacadores with muskets are on the left, and the ones with rifles are on the right. There two of each poses in both packs - actually - there are four of one type in the muskets pack. 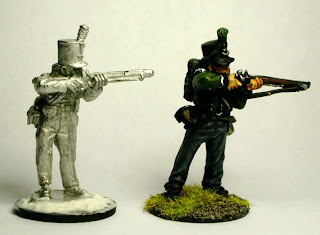 Below is a comparison shot of a Victrix Cacadore (left/unpainted) and a Perry Rifleman (right). Anyway, for the Sharp's game I'm planning to only use 10 of these figures. Five Cacadores will be added to each of the 7-man British Rifles Groups. The rational for this rather large sized 12-man Group is that they cannot form with other Groups into Formations, so hopefully this number will even out their chances against Formations with greater numbers of men. They still may be too strong, as they will be rated as Elite, and most of the French are rated Average. Definitely need to get some playtesting in. In addition to finishing the Cacadores, I also need to finish up the rest of the OG Japanese Infantry and start on the Cavalry unit - the playtesting for these guys using The Sword and the Flame rules is on the 20th of March. For most of the last few months, I was directionless and now I have two concurrent projects with deadlines fast approaching. A WIP photo of a project I just started today. These are Old Glory Japanese infantry from their Boxer Rebellion range. Initially, these were going to be used for a Russo-Japanese War skirmish game using Warhammer Historical's "The Great War" rules. However, it was a back-burner project with really no one else I knew who was interested. 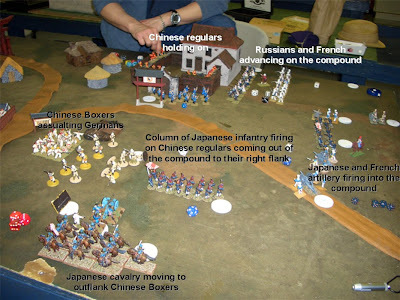 This changed the other week when a fellow NHMGS member posted a call on the NHMGS Yahoo group for volunteers for a Boxer Rebellion game at Enfilade. The GM stated there were enough Chinese Boxers, but anyone who wanted to throw in a National contingent was welcomed. This was all the incentive I needed. The game will use The Sword and The Flame rules - a local favorite, but one which I've yet to try. Actually, the uniform is pretty much identical to the one worn in the RJW - at least in the first part of that war; before the khaki uniform was introduced. These figures are typical OG, some head turning, but with some surprising detail. For instance, the star on the caps are actually pretty well-sculpted. A lot of them look like the guy who played Admiral Nagumo in the movie "Tora, Tora, Tora" - whoever the sculptor was made a good effort. From what I gathered for TSATF, the typical infantry unit is 10-figures, but since the OG packs come with 30, I split them into two units of 15. 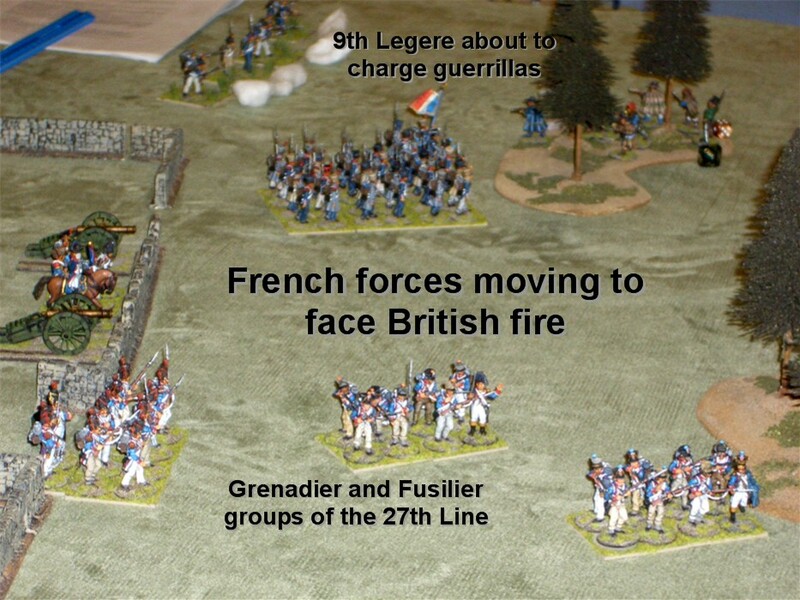 (ADDENDUM: found out from Greg's comment that 20 is the norm for infantry). I'll drop what can't be used at the convention. There were two command sets in this pack - two each, officers, standard bearers, and buglers. The front two ranks are painted as regular line infantry with yellow facings (except for the red shoulder straps in infantry branch red). The guys in the rear two ranks will be painted as Imperial Guardsmen with red facings. I still have to give the white leggings a wash - but it is a striking look against the dark blue uniforms. 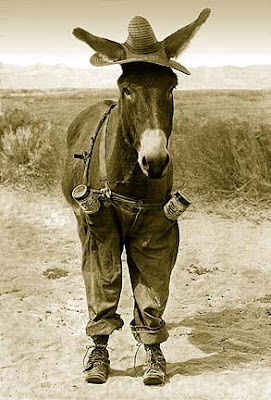 Here's a nice period print of the Japanese Army circa 1900 that I found in cyberspace. I also have a pack of cavalry - also pretty nice; and two cannon with artillery crewmen. 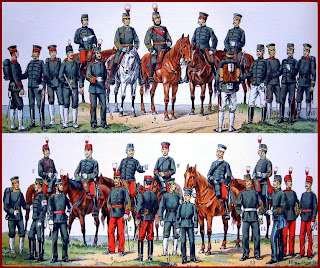 The cavalry will look really cool in red pants with green stripes. 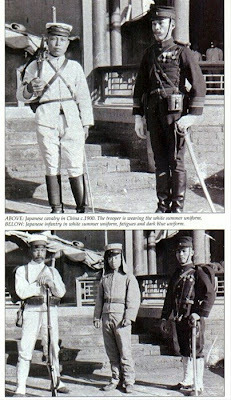 The Japanese army at the turn of the last century totally jumped on the European military pomp band-wagon - so to speak. Plan A is for two 10-man infantry units, one 10-man cav unit, and an artillery unit for the game. 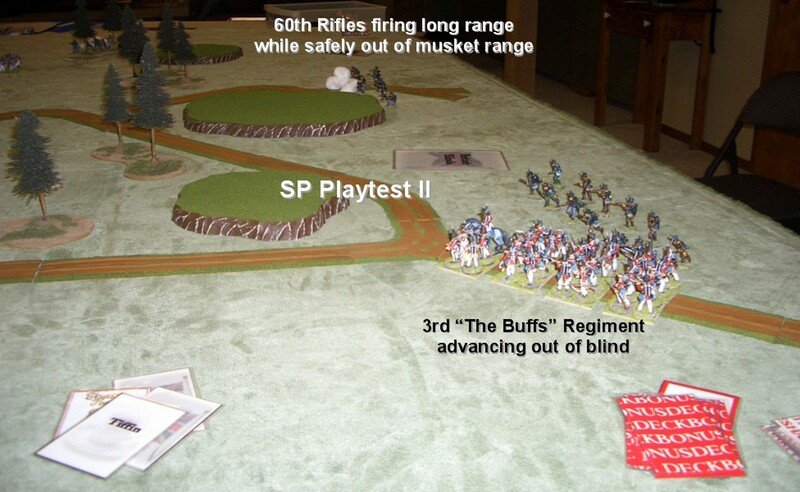 Plane B would be three 10-man infantry units and one 10-man cav unit. nFront Rank Spanish guerrillas for Sharp Practice. These guys will be rated as Poor for the initial playtest. They will appear on the Blank card anywhere on the table up to 12'' from the nearest enemy (French). These are lively sculpts, with a lot of nice details, like the hairnets and pistols carried by some. They look fine along with the Victrix and Perry plastics they will be used with and against. 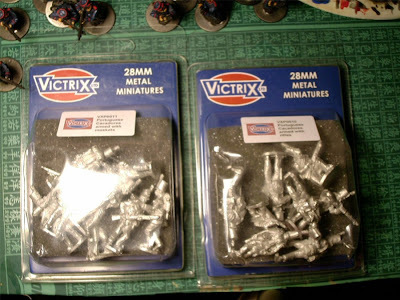 I ended up ordering the Victrix metal Cacadores direct from the UK - they were shipped last week - so hopefully will arrive soon. I've decided to limit the total number of the combined Rifles and Cacadore groups to 12-men. If needed, this number can be reduced or increased - depending on how they work out in the playtests. Here we have the renowned bandit and guerrilla leader, Tuco Benedicto Pacifico Juan Maria Ramirez. When Wellington sought him out in his mountain lair to assist in fighting the French, Tuco famously replied, "So, that's why you came to Tuco. It doesn't matter, I'll kill them all."